Home » Business » Another Major Shock to the World Economies? Another Major Shock to the World Economies? I am not a ‘chicken-little’ or an alarmist of any kind. But, when I see disturbing developments that are going to affect our livelihood and lives, I feel like disseminating that ‘feeling.’ In the attached audio (podcast) bit I sounded an alarm and urged the listeners to take defensive mechanisms with your money and investments. If I know what to do exactly, I would tell you. I don’t know what to do. But let me lead you to some information that sheds light on what is happening now. 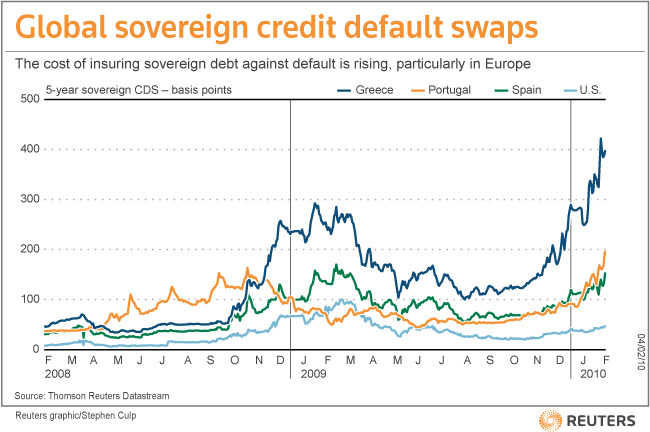 In this audio bit I mention about the unfolding sovereign debt crisis? Washington’s blog, a well informed source, sheds some light on this via a must read article: What Do Rising Sovereign Credit Default Swaps Mean? The following chart gives you a quick idea about the implied risk in sovereign debt, which is at record highs – in some cases higher than it was at the peak of the crisis in early 2009. This is as far as I would like to go in sounding ‘alarm.’ This is similar to what I said back in August 2007. Consider yourself to be warned and take defensive actions.